78 🔼 3 — Daily amount of the received reviews is 78, which is 3 more than on previous day (week). 4.0 🔻0.5 — Current user rating* user score is 4 (users evaluate an app on a scale of 1-5 stars), which is 0.5 less than on previous day (week). *There is a PRO feature for Premium users (only App Store apps). AppFollow collects customer evaluations — ‘stars’ without text comments. It allows adding to report the results just as it appears in App Store. 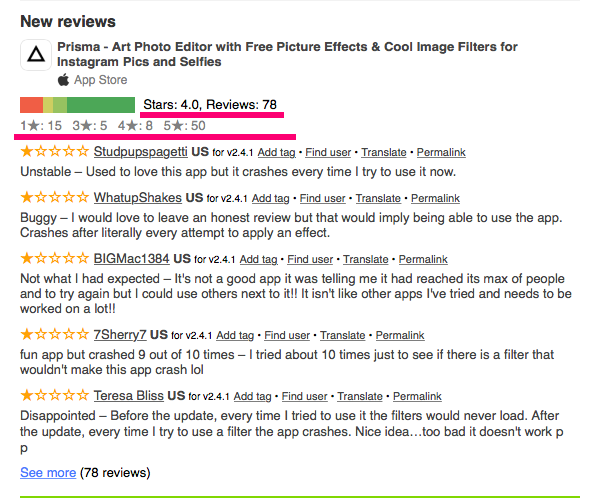 104 — Amount of reviews for current version of an app (The same amount is visible on app’s page in App Store). 4.12 🔻0.33 — Average user score of the current app version is 4.12 (on a scale of 1-5 stars), which is 0.33 less than on previous day (week). 4.201 🔻0.002 — Average user score of app including all versions is 4.201 (on a scale of 1-5 stars), which is 0.002 less than on previous day (week). *All reviews for apps and countries you added in your app collection. Only users with PRO feature All Countries see reviews without limitations. ★1-5 — amount of reviews for each star. Permalink — public link to this particular review for sharing on the web. Clinking See more will redirect you to more detailed report on AppFollow. For more details check out the article User Reviews. Moreover, there is a section called Updated Reviews for Google Play & App Store apps. 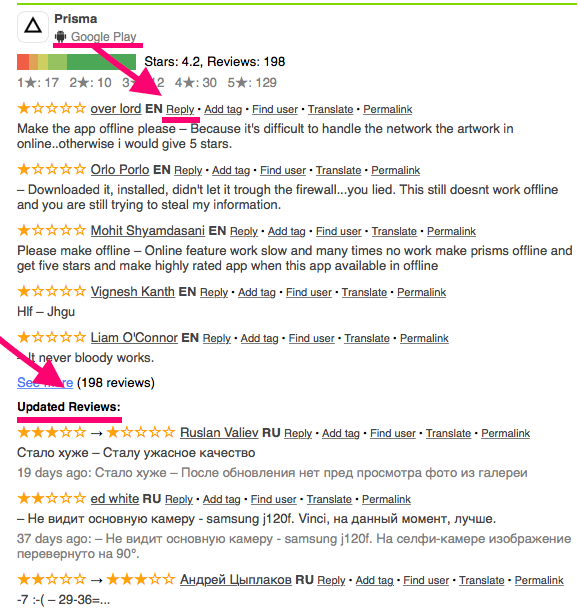 It shows the reviews that have been updated by users within report time period (1 day or 1 week). By the way to speed up replying to reviews, invite your colleagues to access AppFollow account in the role of User. Read more about Multiple User Access to Account.